There is no more versatile karate system than Kenpo. 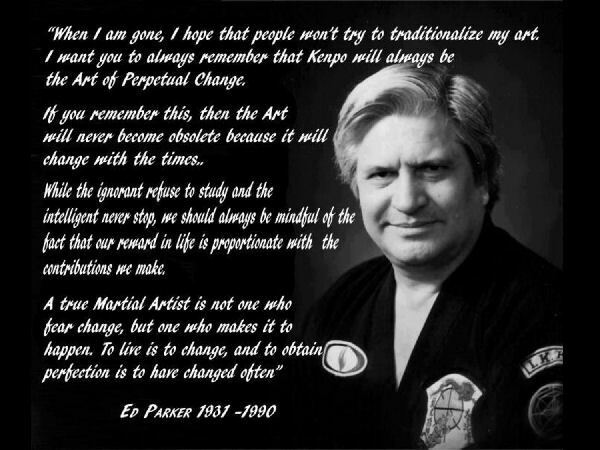 When the legendary Kenpo grandmaster, Ed Parker, opened his first studio in 1956, the heart of American martial arts was changed forever. American Kenpo, meaning” law of the fist”, is a modern combat system of self-defense based upon scientific principles. American Kenpo is primarily a weaponless martial art, characterized by the use of close range strikes delivered with speed, power and maximum efficiency. Founded by Edmund Parker, American Kenpo is credited as the first American martial art. Roots of the system date back to China in the 6th century. As with many Asian martial arts, Kenpo migrated from China to Japan and Okinawa, and then eventually to Hawaii, where Mr. Parker first studied Kenpo from Mr. William S. Chow. Mr. Parker took what he had learned in Hawaii, and over many years, adapted his system for the modern world, producing a sophisticated and highly effective method of self-defense. American Kenpo is a non-traditional martial art, meaning that the art is meant to evolve over time. What works is what matters, so Kenpo practitioners are taught to find the system within the art that works for them. They are taught to question the art, to find the answers, and to constantly improve it. In this manner, Kenpo will continue to evolve to meet the challenges of a changing world. This fluidity and “use what works” attitude is what Mr. Cooper continues to teach as Kenpo evolves forward with the progress of time. What we do today , is not what we did yesterday. Kenpo is the same, a Martial art of perpetual change and evolution into the most effective use for todays environment.